Attention: Your settings got reset due to the SavedVariable changes. Please reconfigure this addon! This verison includes new features, the new API version, a small bugfix and support for FCO Itemsaver. Marked items (by FCO ItemSaver) won't be attached to mails or extracted/refined anymore. -Added better support for FCO ItemSaver's Anti-Deconstruction/Anti-Sell/Anti-Launder/Anti-Trade/Anti-Mail features. If the settings in DoItAll respects the panels of FCOIS, the icons will be checked for their settings at the currently active panel (e.g. marked items for deconstruction, where deconstruction of items marked for deconstruction is allowed, will be deconstructed with DoItAll; where as if you disable this settings in DoItAll simply a set marker icon will prevent deconstruction like before). 2) Do not mouseover the inventory item list while it is deconstructing by addon - you will get lags! It is best used with AdvancedFilters or a similar addon that provides fine-grained filtering. AttachAll has been merged with BankAll to create this addon. Delete the folder "BankAll" in your addons folder. Check the configuration of DoItAll. All of these options can be configured by typing "/doitall" in the chat. Do not touch items that have been saved with Item Saver, on by default. This applies to all DoItAll functions. For transferring items to/from the bank, the batch size and delay can be configured (see below). For deconstruction, researchable items can be excluded, on by default. This requires Research Assistant. 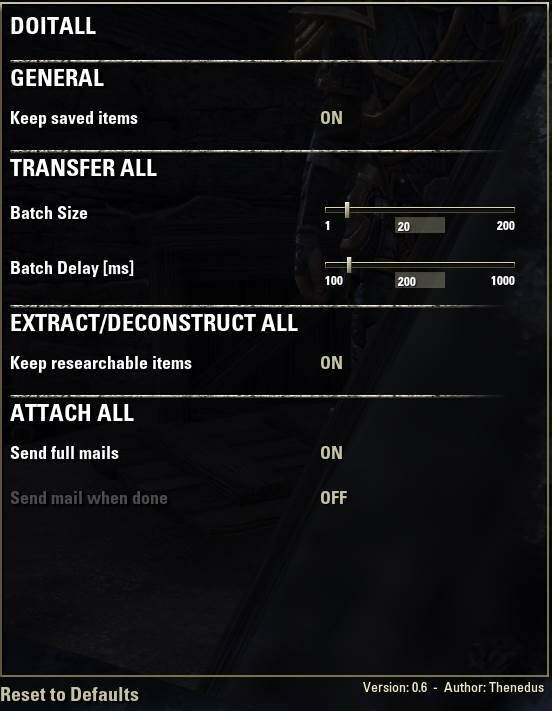 When attaching items, DoItAll can be extracted to send mails when all attachment slots are used and when all items are attached, both off by default. Since each item transfer is a separate action, the server might kick you for spamming if you transfer a lot of items in a short time. To prevent this, items are transferred in batches with a delay between them. By default, DoItAll transfers 20 items in one go, then waits for 200 milliseconds before starting the next batch. To change these defaults, type "/doitall" to bring up the configuration interface. If you get kicked from the server, try adjusting these values and let me know by posting a comment. Fixed: Aborting an extraction at acrafting station could let the extraction in a state where the next manually/by other addon crafted/extracted item would restart the extraction of all other shown items in the list. Changed: SavedVariables to use the CharacterId instead of the name (rename save settings!) and to use server name dependent settings to use the same char name on different servers (eu, na, pts). -> These libraries need to be installed manually (like an addon) e.g. by help of the addon manager "Minion". Please update the libraries and download them to your addons. Fixed: Dependencies to the libraries and other addons so that FCOItemSaver recognition works again as intended! As AutoCategory get's maintained again the addon removed the OptionalDependency to DoItAll now and the OptionalDependcy to AutoCategory was added to DoItAll. Moved "patch" version DoItAll with FCOItemSaver support to the original DoItAll. It's empty, how to specify what item the addon have to store in bank ? .. Read the description maybe and use google translater for it as I'm not able to translate everything to French, sorry. This addon IS NOT DEFINING items to be moved to the bank it is just enabling a 1 button click to move ALL VISIBLE items to your bank (Bank all). This supports filter addons like AdvancedFilters + plugins, FCOItemSaver to filter items you want to move before (manually!). If you want to use addons which store items to your bank by the help of settings try to search for "bank" in the addon search and find addons like "Bank Manager Revived" e.g. Last edited by Baertram : 03/20/19 at 10:16 AM. Last edited by Marazota : 03/02/19 at 06:20 AM. Thanks, will have a look at this. cannot see Launder All button if Fence All reached the limit? Is the launder all button shown before properly, or does it only show fence all? Normal bank = bank. House bank = chest in your home. But as easy as said before: check which version of DoItAll you are using. Did you download it from the comments here? Or from Minion or the download link? I have no idea. House bank vs normal bank? Please explain. Hey, I'm getting logged out every time I move to/from the bank en masse. Any idea if there's a fix? YOu need to increase the intervall to wait between item mass-handling. Check the settings there is an option for the milliseconds. If you move/extract/etc. too many items and the waiting time in between is too low you'll get kicked due to mass-message spam in the game. Are you moving items at your House bank (using the beta version from the comments?) or at the normal bank (officially released version of DoItAll?) ? Last edited by Baertram : 02/16/19 at 02:07 PM. Re: Re: Re: Re: Update for new patch? Is there a way to make it do that? Mass deposit/withdraw from guild bank? My bad. It's not the patch, just can't mass deposit into guild bank, correct? What patch and why is there any update needed? Just enable "Allow out of date addons" checkbox if the game will update. There are comments about this topic further down in this thread. Re: Re: Re: Update for new patch? Re: Re: Update for new patch?